A genetically-modified press release will perform better in search results. If you want differentiated coverage, release the information a few hours or a day ahead to a few trusted journalists. Do the press release the next day to everyone. Know your keywords. Place the name of the brand in the headline of the press release. Know the important parts of a press release. Place your brand name in the HTML Title of the press release, but make it different than the headline. Put variations, if any, along with the name of your brand, in the body of the press release. Link from the press release to the relevant sub-page on your website, not the home page. When you just send out a press release the same story, to the word, often gets published. But if you select a short list of high profile journalists to "leak' the content early, you will get stories written with more prominence that with the press release alone. Then, after a day or so, release the press release to fill in the rest a day later. Your initial private releases will have performed much better in most cases. There are four steps to writing an SEO press release. First, know your keywords. The keyword is what people will be entering into a search engine to find products and services. You’ll need to have primary and secondary keywords (or key phrases). The keyword / search phrase needs to be topically relevant between both the press release and the site the press release will eventually link to. This is your main key phrase. Whether it’s a brand name, a product, or a service, this is your number one key phrase. It will be placed differently than other less significant key phrases. The main key phrase might be very competitive, like “prepaid SIM” or something slightly less competitive (long tail) like ‘prepaid china SIM card’. The second key phrase is less competitive because it is more specific. Choosing key phrases deserves a book of its own, but we won’t go into a lot of detail here. Let’s assume you know what your primary key phrase will be. Chris Anderson wrote a book called The Long Tail, arguing that successful commerce lies in less known, more obscure products, of which less sell but for which more people search. The Long Tail concept applies to key phrases as well. Less commonly used Long Tail key phrases are not as competitive as primary key phrases, but there are a lot of them, and together they can generate more total searches than your general, highly competitive terms. 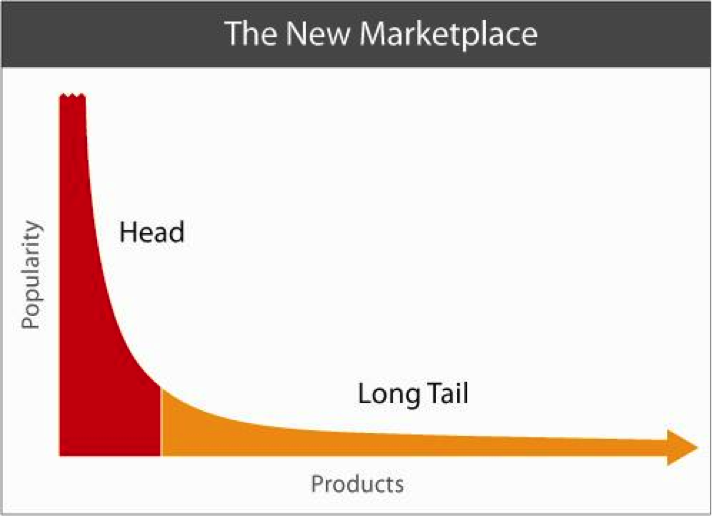 Here’s an example of how the Long Tail works as related to products. So while your primary key phrase may be a brand name, or a competitive product or service, your secondary key phrases can be Long Tail; in other words, LESS searched, and fairly easy to weave into the body of your press release. These Long Tail or secondary key phrases can have overlapping words with your primary key phrase, or be semantically similar. Include the primary key phrase in the title. If possible, the words should be towards the beginning of the title. Keep it around eight words if possible. This is where you want to place your primary key phrase, or a semantically similar version of it. Summarize the press release in two or three sentences. Include the primary key phrase and possibly a secondary key phrase. Write the body of your press release. Place your primary key phrase in the first sentence, if you can. If not, then place it soon after. You’ll be weaving key phrases into your document in a balanced way, but don’t ‘spam’ the press release. Spamming is also known as ‘keyword stuffing’ and it’s a practice search engines frown upon, and that can diminish the strength of your release – so go for keyword balance. There is both science and art to writing a good SEO press release. On the one hand, you are writing the press release for people, so it needs to be written so that it reads naturally. On the other hand, few may see it if the search engines aren’t impressed, so you are writing for the ‘Google Bot’ as well. Finding that perfect balance between writing for people and machines is what separates the talented from everyone else. This is the third-person summary of the company: a good place to put a relevant secondary key phrase. This is where the media contact for inquiries goes. Again, you don’t need to format it that way because it will be done automatically for you by the press release distribution company. But you should know that the title of your press release should have your primary key phrase in it, because it will become the Title tag when it makes its way online. The Title tag is the most important tag for search engine optimization. It is the first place search engines look when trying to figure out what your press release is about. The summary should have your primary key phrase in it, as well as one or two secondary key phrases. If it sounds contrived having too many key phrases in it, default to only one. If the key phrase still doesn’t read right, you can adjust it slightly. Search engines are smart, so they will know what you mean. But try to keep it as close to the original key phrase as possible. 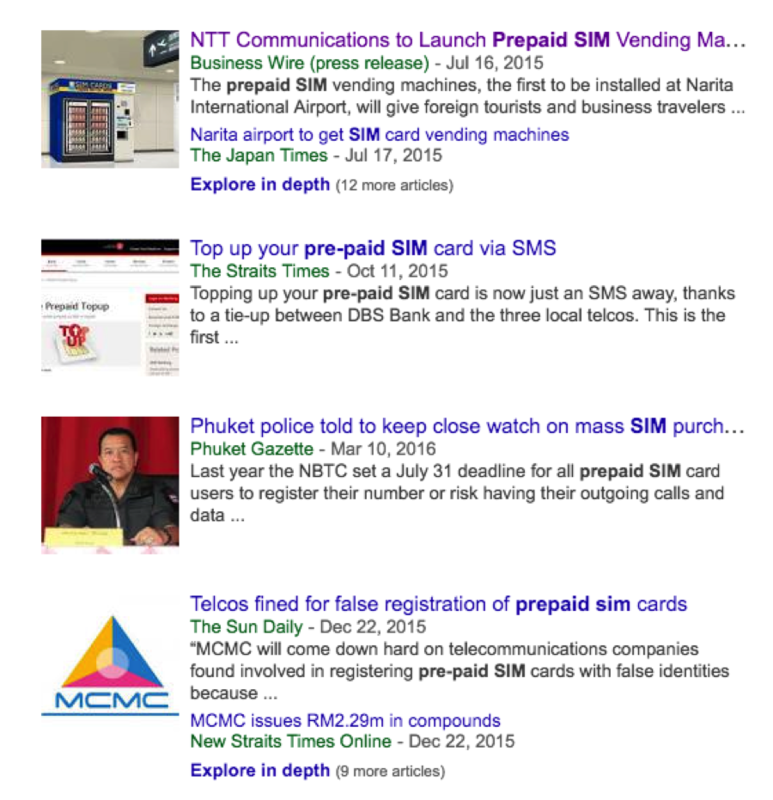 The illustration below shows Google News search results for the search term “prepaid SIM”, but the same general results also come up for “prepaid sim card” or “pre-paid SIM” and similar terms. Tests show that links higher in body copy perform better than links further down. In this case the link could be higher, but at least it’s there. As a rule of thumb, place three or fewer links in a press release. This press release is pushing “authority” to the website http://www.ntt-bp.net/jcfw/en.html that enhances the relevance of the ntt-bp.net site for the search term “prepaid SIM” and other terms contained in the press release. The link is also directing traffic to their site that has clear “user intent” to Google. For example, Google knows what the press release is about because it has read the text. It also knows what the ntt-pb.net site is about because it’s read that site too (in both English and Japanese). There is a clear topical link between the two that is enhanced by the link between the press release and the web page. Each link is a “vote” and links from topically relevant pages like the press release have far more voting power than a link from a bakery or non-topically relevant site would. In the SEO world, press releases are often considered fleeting things. They’re about news, and news ages quickly. Search engines know this and tend to push a good press release up in search results. If people click on it and read it, the release will have more longevity. The art and science of writing a good SEO press release comes into play here: it has to be noticed by search engines to be read by people. At the same time, it needs to be compelling enough that people will not just click on it and then click away. Ideally, you want people to stay and read the press release for at least a minute or two before clicking on a link in it, or worse – going back to Google, Yahoo, or Bing and doing another search. This last action is called a bounce, and can diminish your press release in search results. So write a good, compelling release, but keep our robotic search engine friends well fed, too.